Been diving in Sebayur Kecil? Please Vote! This is a fantastic dive site in the Komodo region and one of the few dive sites of the area that does not have large amounts of current. The dive site is a great place for divers to learn how to dive or for refresher courses. 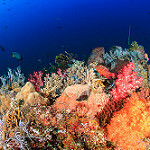 The reef starts at around 5 metres and there, divers will find the start of the dive as a wall dive. This is covered in some fantastic sponges and corals, and then the wall drops down to a sandy bottom at around 30 metres. Visibility can get up to over 30 metres but this is very much reduced in winter or rainy months when it can get to as little as 5 metres. At around 25 metres, there is a sea mound that is a great place to spot pelagic fish. Divers can expect to find many butterflyfish, pufferfish, and Napoleon Wrasse. 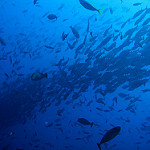 Large groupers have also been spotted on the dive spot. There are moray eels, stonefish, leaf scorpionfish, fusiliers, and bumphead parrotfish. The deeper parts of the dive spot, particularly around the sea mound, have many giant sweetlips, trevally, white tip reef sharks, sting ray, eagle rays, and black tip reef sharks. Along the wall, amongst the many soft corals, divers can find many lobsters, crocodile fish, nudibranchs, and flatworms. Map of Komodo, Sebayur Kecil dive site.